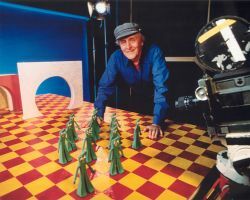 San Luis Obispo – October 12, 2011, we celebrate Gumby creator Art Clokey’s 90th birthday, and Google is honoring this stop motion pioneer with a doodle. Google’s home page will feature a unique interactive stop motion clay doodle created by the Clokey Productions Premavision studios. Coinciding with the birthday fanfare is the premiere of the new Gumbyworld.com website—Gumby’s new home! A true visionary and pioneer, Art Clokey touched millions around the world with his creations. Art’s clay animation short Gumbasia expressed an exciting kinesthetic brand of film making that has influenced many of our current leading directors. The new Gumbyworld.com website is rich with new, classic and rare film clips, pictures, biographical information about Art Clokey’s formative years along with an in-depth look at his five decade long run of his cutting-edge film making. From the Adventures of Gumby and Davey and Goliath to surrealistic art films, Art Clokey had a fascinating and influential career. The new website Gumbyworld.com is the most comprehensive look ever at the iconic green clay boy and all of the other characters in Art’s limitless universe of imagination and artistic expression. Included are clips of Art Clokey talking about the creative process and a look into some of his lesser known pilots. Gumby and Art Clokey, two American originals. Renowned animator Anthony Scott created the doodle animation. Scott is known for his animation direction and supervision on Coraline, Corpse Bride and The Nightmare Before Christmas. Scott got his start in animation working on the 1980’s Gumby series, under Art Clokey himself. He was also the lead animator under the direction of Art’s son Joe Clokey on the Davey and Goliath Snowboard Christmas movie, which was released in 2004. 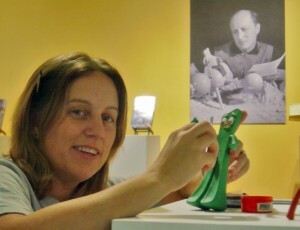 Gumby lead puppet maker Nicole La Pointe-McKay modeled the various characters for the Google animation. Clokey Productions and Premavison studios, founded by Art Clokey in 1956, produce stop motion animation TV series, films and commercials. They are best known for creating the iconic characters Gumby, Pokey and friends and Davey and Goliath. 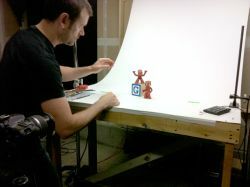 Located in central California, they draw the most talented animators, puppet makers and set designers in the industry. Calling All Gumby Fans! GumbyCentral is Now Live! GumbyCentral, the official social media source for all things Gumby, is looking for a few million fans. We know you’re out there! We’ve gotten truckloads of mail and terabytes of emails over the years from fans who want to express their appreciation, have questions or want to know what’s new. Now you can become a fan of GumbyCentral on Facebook, follow us on Twitter and subscribe to our YouTube station to keep up on Gumby’s newest news. Gumby fans are everywhere. Online you can find creative videos by long-time Gumby aficionados who hop into a Gumby costume for some interesting break dance maneuvers and unbelievable crazy antics. Others photograph or film their Gumby bendable figure in exotic locations. Fans show their love for Gumby offline by sporting Gumby hairdos and donning Gumby-inspired green apparel. You may have even seen a Gumby and Pokey or two roaming the streets. Hint: they are often seen at major sporting events. During a trip to northeastern Ohio not long ago, we ended up behind a custom-painted, Gumby-green car with Gumby license plates. Gumby creator Art Clokey would have loved the ingenuity. Show your Gumby spirit, and join us on Facebook, Twitter and YouTube! 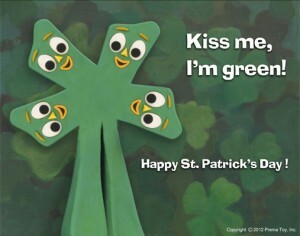 Let Your Inner Gumby Out! With Halloween just around the corner, we’re pulling out our Gumby and Pokey costumes. The new Gumby costume has been incredibly popular—and not just for Halloween. Gumby costumes are popping up everywhere. We’ve heard about fans who keep the costumes in the trunks of their cars for easy access when they happen to be in situation that invites a green laugh or two. Need a character for your next video? Check. 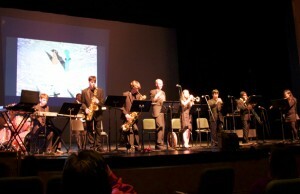 Need to entertain guests at a birthday party? Check. Need to dress up for a parade? Check. Gumby’s ready to go. Gumby’s no stranger to the sports arena. 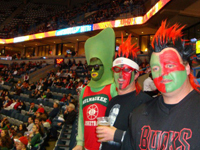 One of the most common uses for the Gumby costume is to cheer teams on at nationally televised basketball, baseball and football games. We’ve seen Gumby a number of times cheering from the stands on ESPN coverage of college basketball games, even from the front row. 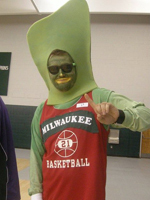 The Milwaukee Bucks have an “official Gumby fan” who made his own outfit. 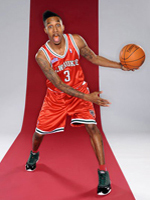 The Bucks star player sports a Gumby haircut. There is another player, on the Green Bay Packers, whose nickname is Gumby. Gumby and sports—it makes sense. Gumby is known for his flexibility and tenacity to succeed. He stretches for excellence. We at Gumby Central love all of these. 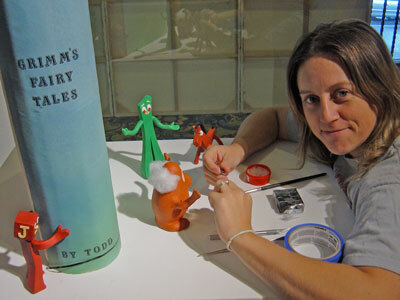 Art Clokey, Gumby creator, would have been honored. A true pioneer in stop motion animation who always pushed the envelope of the imagination and had a great sense of humor… that’s Art Clokey. 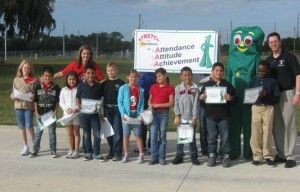 The creativity that fans show is true to Gumby’s positive, enthusiastic spirit. We’ll be sharing some of the fun ideas we come across on GumbyCentral, Gumby’s official social media sites. So you’ll want to become a fan on Facebook, follow us on Twitter, and subscribe to our YouTube channel. Send us your favorite Gumby-inspired costume shots, and we may feature one in the Gumby Fans Hall of Fame or in a future blog post. Email us here. P.S. Don’t forget Gumby’s pal Pokey—he has a costume, too.